Whether you are a devoted spouse or contending for the top spot of favourite child, here at VroomVroomVroom we've got the best New Zealand destinations and creative ideas sure to surprise and delight Mum on Mother's Day. Make sure to check out our variety of fun things to do and cool itineraries to help make her special day truly unforgettable. What better way to amaze your mom by bringing her in the far north of New Zealand. 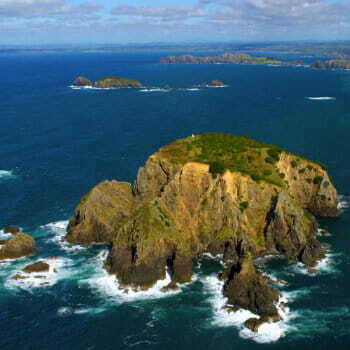 Just a short 240 km trip in your rental car from Auckland is the beautiful Bay of Islands. Take a ferry trip, swim with the dolphins or visit The Hole In The Rock. There are plenty of fun filled or relaxing activities to indulge in. The Bay of Islands Country Rock Festival will also be held over the entire Mother's Day weekend to provide Mum with that extra bit of entertainment. Where to stay? Bay of Islands provides numerous accommodation and dining options as well. Most visitors and tourists opt to stay in Paihia or Russell (only a short ferry ride) as both towns easily connect you to other areas of interest in the Bay Islands. Paihia is the perfect place to start exploring the coves and beaches of the Bay of Islands. Just west of Paihia is Haruru, where you will see a breathtaking waterfall. Take time also to visit the historic site where the Treaty of Waitangi was first signed between Maori and the British Crown. Dip into history, browse art galleries and enjoy fresh local produce with your mom in the charming town of Kerikeri. For historic buildings and seaside setting, the romantic town of Russell is another perfect base for exploring the Bay of Islands. For a quirky experience, stop and see the colourful Hundertwasser toilets when you drive through Kawakawa. The small town of Kaikohe is an excellent base to stopover for refreshments on the way up the Twin Coast Discovery Highway. The friendly town of Okaihau is also worth-stopping if your mom enjoys a classic Northland pub. Getting there: You can rent a car in Auckland with VroomVroomVroom to take advantage of affordable rates, then drive your rental car to the Bay of Islands in an approximately three hours and take in the wonderful landscapes via the east coast highway. Offering an incredible backdrop for a range of sights to see and things to do, Queenstown is the perfect place if your moms are looking for fun and exciting adventures. From hiking to biking to jet boating to white water rafting to skiing - all these are guaranteed to get her blood pumping. Where to stay? Queenstown provides a range of accommodation options that suits your style and budget. Among the most popular areas include the Glenorchy Road, Kingston Road, Gibbston Valley and Arrowtown. Enjoy a tour of some of Queentown's wineries and cellar doors in Gibbston and discover just why Central Otago Pinot Noir is famous on the world stage. Marvel at the stunning views of Lake Wakitpu and the Remarkables. Or ride the Skyline Gondola to the top of Bob's Peak. There's also plenty of hiking and biking trails to discover as well as beauty and wellness options to choose from to help her relax and rejuvenate. Combine a round of golf at one of Queenstown's spectacular clubs. Getting there: You can rent a car in Queenstown with VroomVroomVroom. 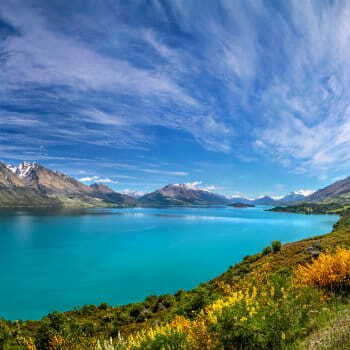 The scenic drive from Kingston to Queenstown takes an approximately 25 minutes, while a drive from Glenorchy to Queenstown takes around 50 minutes. Now is the right time to discover why Rotorua is on everyone's must see list while in New Zealand with your mom. Recognised as the thermal wonderland of the country, the hot springs, geysers, mud and sulphur pools are the famous tourist attractions guaranteed your mom would adore. 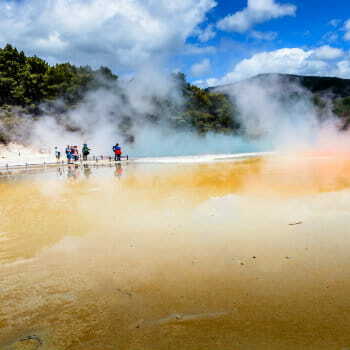 Nearby Wai-O-Tapu is also a hit because of the hot springs noted for their colorful appearance. Where to stay? There is plenty of accommodation to choose from in Rotorua. Near the lake, you will find some of the best hotels, cosy lodges and thermal motels. While on Fenton Street located in the heart of Rotorua you will see numerous five star spa hotels, motels and plenty of backpacker hostels. Experience authentic traditional Maori villages like the Buried Village, Whakarewarewa, Te Puia or Mitai. Spoil and treat your mom with natural spa time - thermal baths, mud baths and healing mineral pools. Another must do whilst visiting Rotorua is the Rainbow Springs Wildlife Park. Take a gondola ride to the top of Mt. Ngongotaha with scenic views while enjoying a glass of wine. Getting there: Finding your way to Rotorua in a reliable car hire is easy with VroomVroomVroom. The city is only 2.5 hour drive from Auckland and a 5.5 hour drive from New Zealand's capital city of Wellington. The Rotorua Airport is only 10 minutes from the CBD. 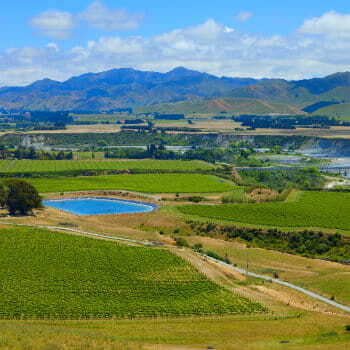 Located at the top of the South Island is the Marlborough region. Most popular for its world-renowned wine and award-winning vineyards, Mum will treasure the wine tasting experience she's being treated to. A tour of vineyards throughout the area can be taken by bus, or for a more unique experience, by bicycle. Where to stay? Either Picton or Blenheim will suit. Uncover the enchanting history of Edwin Fox Maritime Museum which can be found at Dunbar Wharf in Picton. Another must-visit is the Omaka Aviation Centre which features Peter Jackson's own collection of WWI aircraft and artifacts. Don't forget your camera as you and your mom walk through the beautiful Queen Charlotte Track. Only 10 minutes drive from Blenheim, enjoy Saint Clair Vineyard Kitchen's award winning wines accompanied with great cuisine. Getting there: Most of Marlborough's amazing landscape can be accessed by vehicle. Find a great car rental deal in Picton with VroomVroomVroom. Note that the Queen Charlotte Drive links Picton and Havelock, and travels via stunning scenery, or just turn off after Rai Valley to drive to French Pass. Driving time from Christchurch to Marlborough is at least 4 hrs 30 mins, while it takes an approximately 2 hours from Nelson to get to Marlborough via rental car. Looking for some general road rules and safety tips? Check out our Driving Tips in New Zealand.